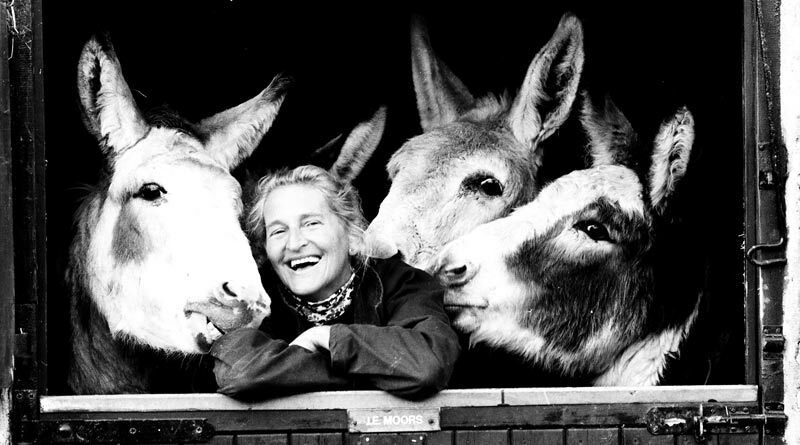 Dr Elisabeth Svendsen would have turned 89 on January 23, and The Donkey Sanctuary’s 50th anniversary celebrations will kick off on that day. This year marks the 50th anniversary of the founding of The Donkey Sanctuary in Britain, and a host of special events will kick off on January 23, which would have been the 89th birthday of founder Dr Elisabeth Svendsen MBE. Since 1969, The Donkey Sanctuary has been pushing for a world where donkeys and mules live free from suffering and their contribution to humanity is fully valued. With dedication and compassion, this work continues to this day, inspired by the vision that Dr Svendsen started all those years ago. An awareness-raising highlight of the year will be presenting an artisan garden at the RHS Chelsea Flower Show in May. The ‘Donkeys Matter’ garden will act as a focal point to celebrate the milestone year and showcase The Donkey Sanctuary’s international work. To coincide with the launch, the charity is releasing a selection of archive images, many of which show Dr Svendsen, known affectionately as ‘Dr S’, at work during the early days of the charity. The Donkey Sanctuary has grown into the world’s largest equine charity and is now one of the biggest employers in east Devon, benefitting the local economy exponentially. It all began when Dr Svendsen acquired her first donkey, Naughty Face, in 1969. Shortly after, she was so shocked by the appalling condition of seven donkeys on sale at an Exeter market that she decided to dedicate her life to saving donkeys in distress. Dr Svendsen with Charlie girl and her foal, Angel; the 1269th arrival at The Donkey Sanctuary. A new event to help mark the landmark year will be the inaugural ‘Dawdle for Donkeys’ in June. A 5km and 10km course will take in the beautiful countryside around the Sidmouth sanctuary overlooking the world-famous Jurassic Coast. It is the perfect way for family and friends to get out and about and raise funds for donkeys. Commemorative memorabilia will also be available to purchase from the Gift Shop at the international headquarters in Sidmouth. Unique items include anniversary mugs, tea towels and key rings, and a specially commissioned Monopoly board game, with all profits going towards helping donkeys in need. Dawn Vincent, head of communications at The Donkey Sanctuary and granddaughter of founder Dr S says: “My granny’s story is just incredible, she was a successful businesswoman and was looking to start breeding donkeys of her own. But when she saw the state of a group of donkeys in a market, she decided she needed to do something. “She never stopped coming up with ideas on how she could improve the lives of donkeys and people. She was a trained nursery teacher and developed the donkey-assisted therapy work with children. When she travelled abroad, she saw how donkeys were suffering and wanted to help them too. Now we have a huge global programme working in 40 countries. Dr Svendsen with rescued donkey Blackie Star at the Peropalo festival in Spain in 1987. Donkeys Matter garden designers Annie Prebensen and Christina Williams. • At the Chelsea Flower Show, the charity’s ‘Donkeys Matter’ garden will use water as its central theme. The garden will demonstrate how owning a donkey means access to clean, fresh water for some of the poorest and most vulnerable communities in the world. Concept drawing of the Donkeys Matter Chelsea display. In places like Namibia, Lamu, Somalia and Ethiopia, donkeys are used to collect water for whole communities. A donkey will often collect 40 – 60 litres of water at one time. The simple act of a donkey carrying water reduces the time required to access it, freeing children to get an education and women to be economically active. The garden is being made possibly thanks to a donation from a long-term supporter, expressly for a garden at the RHS Chelsea Flower to showcase The Donkey Sanctuary’s international work and to highlight the plight of donkeys and their contribution to humanity.